How to remove stains and spills. Alcohol, Coffee, Tea, Liquid food or Urine. Use the detergent and vinegar solution. Just a little at a time. 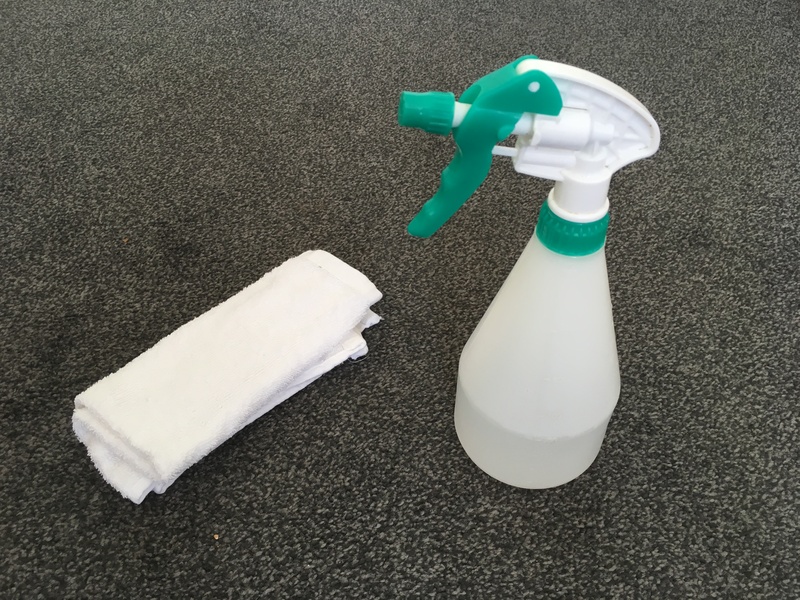 Remember to add detergent to the cloth/towel rather than to the carpet/fabric. Work from the outer edge of the stain inwards. Frequently blot with a dry, preferably white, cloth. See below for final rinse procedure. Chocolate, Sweets, Blood, Glue, Egg, Ice cream, Milk, Soft drinks, Vomit. Scrape up excess with a blunt knife, old credit card or something similar. Use the detergent solution starting at the outer edge. Follow up with the ammonia solution starting at the outer edge. Solids, Fats, Tar, Chewing gum, Oil, Shoe polish. Use a dry cleaning solution (the surgical spirit) followed by the detergent and vinegar solution. Scrape up excess with a blunt knife, old credit card or something similar. Blot surplus spillage. Use a dry cleaning solution (surgical spirit) followed by clean luke warm water. If further treatment is needed, use detergent or detergent and vinegar solution. Final Rinse Procedure- use after all of the above stain removal methods. Mix one part white vinegar and four parts water. Pour mixture into a spray bottle and spray over stained area. Blot dampened area (do not rub) to remove excess moisture. Spread white kitchen towel (about 6-8 sheets) or an absorbent cloth over the affected area and place a weight, such as books, on top. Leave overnight and repeat if necessary. This stain removal guide is basic but it should help prevent some common and expensive DIY stain removal damage. There is never a guarantee of complete stain removal but if you follow the above steps it will give us at Refresh, when called, the best possible chance of success. Remember. Act quickly. Scrape up solids, blot up liquids. Take plenty of time, it is worth the effort. Mix the solution accurately and test it on an out of the way piece of carpet. Always work from the outer edge of the stain to the center. Dab or blot rather than rub or scrub. And, most importantly, Never over wet. Copyright © 2018Refresh.All Rights Reserved.Web Designby Urban Attic.